Eagles cornerback Ronald Darby and his DB mates might have their hands full Sunday with Tampa Bay's talented receivers. The Buccaneers, to some surprise, opened the season with a 48-40 win at the Saints. The last time they had put up at least 40 points and won was in a 45-17 pasting of Chip Kelly's Eagles in November 2015. They have several explosive weapons, but they are without starting quarterback Jameis Winston, who will be serving the second game of a three-game suspension when the Eagles travel to Tampa on Sunday. Ryan Fitzpatrick isn't your typical backup. Like the Eagles' Nick Foles, he can win games. He's hung around the NFL for 14 years for a reason. But his inconsistency is why he's also played for seven teams. The Eagles don't know which quarterback they'll get, but they're preparing for the one who had a perfect passer rating (156.3) against New Orleans. Eagles defensive coordinator Jim Schwartz: Fitzpatrick has been around for a long time. He got hot, and New Orleans had a hard time getting him stopped. Yeah, it was eye-opening to watch it for sure. Not all 48 points came from the offense. The Bucs defense accounted for seven with a fumble returned for a touchdown. But that was about its lone highlight. The Saints have a potent offense, but defensive coordinator Mike Smith's unit has been leaky going on three years. The Bucs have three. We know about DeSean Jackson. The speedy wideout caught five passes for 146 yards and two touchdowns in New Orleans. He left early with a concussion, but practiced Thursday and could be ready. Mike Evans is Tampa's top target. The 6-foot-5, 231-pound receiver had seven catches for 147 yards and a touchdown Sunday. Saints cornerback Marshon Lattimore, the reigning NFL defensive rookie of the year, had no answers for Evans. Despite his size, Evans moves well, as he showed here, when he got behind Lattimore for a 50-yard touchdown. Lattimore made the costly mistake of not using his hands at the line. But even when he bumped Evans, as he did here, Evans was still able to go and get the ball. Schwartz: Even if he's covered, he can still be open. He's a very physical player. You have to be physical with him. The Bucs' Chris Godwin is a budding talent, but he's no third wheel. Fitzpatrick: We're really looking forward to him making a jump from last year to this year because he's going to be a special player. Adam Humphries is the Bucs' slot receiver, but Godwin can line up anywhere and be just as effective. A rub route helped with separation on this play, but the diving 16-yard grab was all the former Penn State receiver. 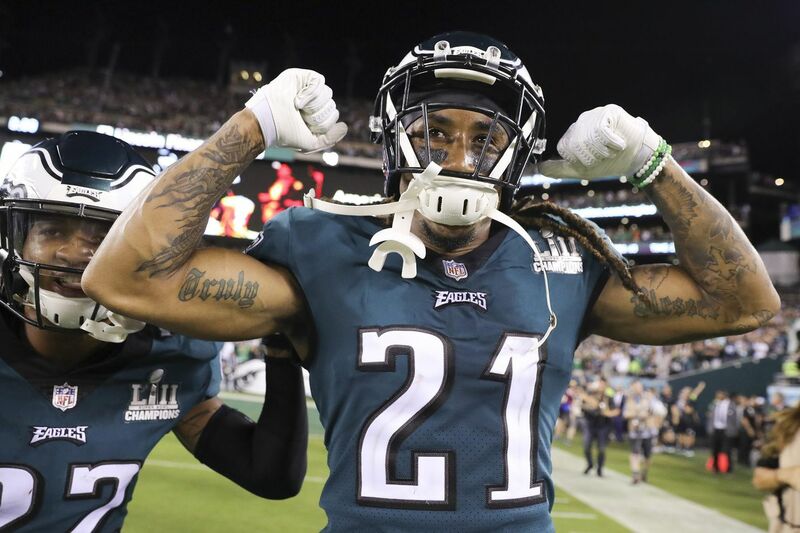 Eagles cornerbacks Jalen Mills, Ronald Darby and Sidney Jones have their work cut out for them. Tampa has two athletic tight ends – O.J. Howard and Cameron Brate — who can get down the field. Schwartz: All their tight ends are huge, 6-foot-6 guys. Gives the quarterback a big strike zone to be able to throw it to. You've got to be careful in man-to-man coverage of keeping good vision on the quarterback as well as seeing your player, because the quarterback has such a big area that he can throw a guy open. Howard was matched up vs. a safety here, and while the coverage was tight, Fitzpatrick put his pass in a place where only his tight end could catch it. The Bucs will often line up both tight ends on the field. They used two or more tight ends on 21 of 62 plays vs. the Saints, but went to the air only five times. The Eagles safeties will mostly match up one-on-one with Howard and Brate, but the linebackers have to be prepared if the Bucs throw out "12" personnel. Eagles linebacker Jordan Hicks: We're going to have to win one-on-one battles. Fitzpatrick is throwing the ball up to them, giving them opportunities to go make plays. Fitzpatrick completed 21 of 28 passes for 417 yards and four touchdowns. He was named NFC offensive player of the week. He completed nine passes of 20 yards are longer. Bucs coach Dirk Koetter loves the vertical passing game, and Fitzpatrick was dealing against the Saints. Jackson was wide open on this deep corner, but his quarterback hit him in stride for a 58-yard touchdown. The Eagles must be ready for the long ball. Eagles safety Malcolm Jenkins: We had five plays over 20 yards, so the big plays are already an emphasis for us. … He's definitely not going to come in gun-shy. Fitzpatrick still can escape with his legs, but he's much better – like all quarterbacks – when given time. The Bucs offensive line isn't considered a strength, but it kept him clean all game. Fitzpatrick had a ridiculous amount of time on this pass. The Eagles defensive line should pose more of a threat, however. Ali Marpet played center last season for the Bucs, but is back at left guard and is a solid run blocker. Ryan Jensen is the new center. Fletcher Cox should be able to win a few inside battles. The Eagles line recorded four sacks and 14 quarterback hits last week vs. the Falcons. Fitzpatrick: They play so fast, flying around, having fun. They got a swagger about them that shows up even up on the coaches tape. The Bucs signed former Eagles Vinny Curry and Beau Allen and traded for Giants defensive end Jason Pierre-Paul this offseason. All three start, but defensive tackle Gerald McCoy is still the linchpin. He typically lines up in the three-technique, but he'll move over the center and slide out to the five-technique as he did on this tackle for loss. Eagles offensive coordinator Mike Groh: They really invested heavily in the defensive line. It's obviously all built around Gerald McCoy. He's a guy that can wreck the game, so somebody that we got to pay special attention to. Eagles coach Doug Pederson: He's big, he's physical, athletic, definitely pushes the pocket. He's a great pass rusher. Eagles guard Brandon Brooks faced off against McCoy in 2015 with the Texans. McCoy was held sackless that game. Brooks: We had our battles. You win some. You lose some. Pierre-Paul has a knee injury, but he practiced Thursday. Curry rushed more from the left side in the opener and picked up a sack. He will have his hands full with Eagles right tackle Lane Johnson. Linebackers Lavonte David and Kwon Alexander don't come off the field. They struggled in coverage against the Saints, allowing a combined 15 of 15 targets for 167 yards and a touchdown. To be fair, running back Alvin Kamara would give any linebacker fits. But Alexander flashed his ability on this play when he snuffed out a screen. Alexander also forced a fumble later in the game. Groh: Their linebackers obviously really set the tone there with Kwon Alexander and Lavonte David, guys that have played a lot of good football over the last several years. I recruited Kwon Alexander out of high school, so I have followed him for a long time. Vernon Hargreaves, the Bucs' top cornerback, was placed on injured reserve earlier this week. Veteran Brent Grimes, who mans the other side, has yet to practice. Even if Grimes goes, Tampa will have to rely on Ryan Smith. He struggled in place of Hargreaves last week. The Bucs were protecting a lead and had Smith drop into a deep zone on this play, but he got turned around and allowed a 16-yard catch that stopped the clock. Mike Smith mixes his coverages up, like any defensive coordinator, but he plays a lot of Cover 4. Eagles quarterback Nick Foles: They're typically a quarters team, but they're going to give you all the different coverages. They do a good of disguising. They're going to disguise it from a shell. They're going to roll. They're going to go man. While quarters should protect against the deep ball, there are holes. Foles will need to pull the trigger as Drew Brees did here, for instance. The Eagles will likely need receiver Mike Wallace to take advantage of the Bucs' backup corners.